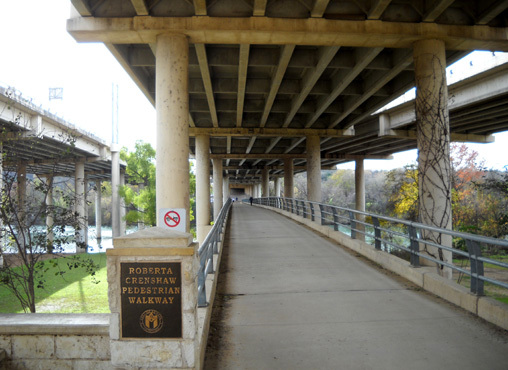 "The City of Austin has developed one of the finest trail systems in the nation. 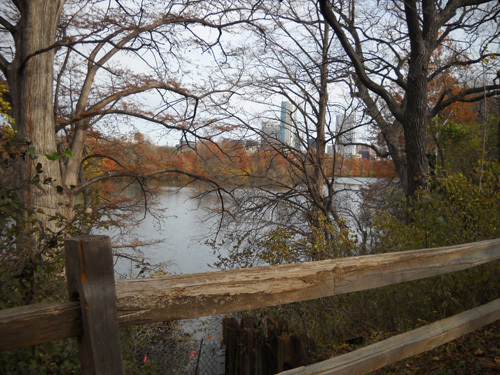 into all areas of the city, making an excellent trail accessible to all . 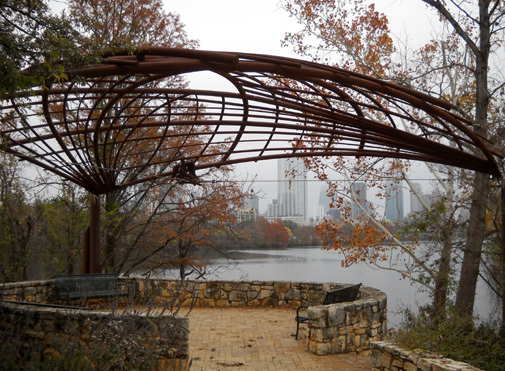 . . "
I am totally impressed with the network of packed-surface trails near downtown Austin! 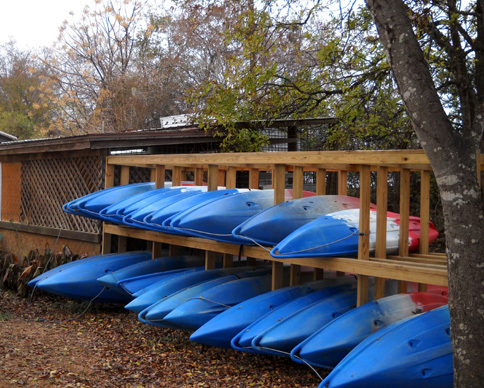 It is a wonderful resource for residents and visitors alike. That's high praise, coming from a mountain trail junkie like me. These urban paths are just about the antithesis of the remote single track trails I love but at this stage in my (non)running career, they are perfect. They are also perfect for anyone who wants to run, walk, cycle, or do speed work on a convenient, safe, smooth but non-paved surface and doesn't mind having company during a workout. 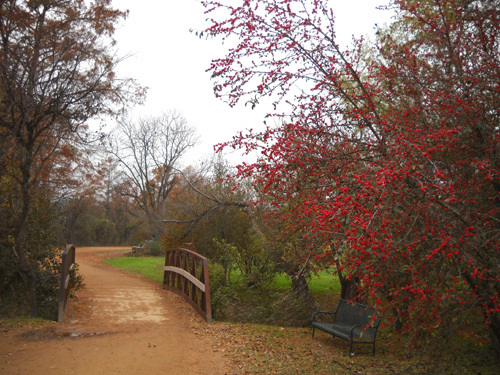 We've run and walked three times on parts of the 10+ mile long Town Lake Trail, the centerpiece of the greenbelt system, but we haven't had time to explore any of the numerous shorter paths that radiate off the main loop. They range from about one mile to over eleven miles, usually following lakes, scenic ravines, or creeks that drain into the Colorado River from the north or south. I must digress here for a moment and show my geographic ignorance. 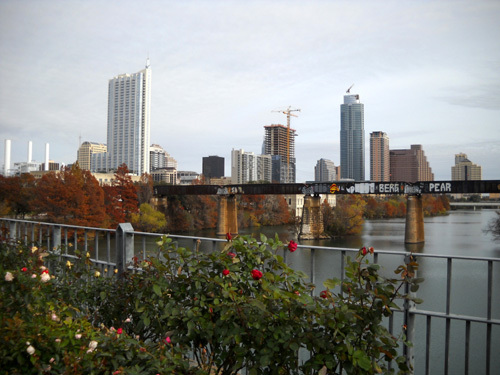 Until I did some research, I was a bit mystified about the Colorado River, which runs right through the heart of Austin. Huh? How the heck did the mighty Colorado River get to Texas?! I know that its headwaters are on the west side of the Continental Divide in Rocky Mountain National Park, it courses through the Grand Canyon of Arizona, and it dumps into the Gulf of California. It definitely does not go southeast to Texas. Well, this is a different Colorado River that flows for about 600 miles totally within the state of Texas! I had no idea there were two Colorado Rivers in this country. I suppose it's for about the same reason why there are seven Brush or Brushy Mountains in Virginia -- whoever originally named the river in Texas either didn't know about the other one or didn't give a hoot. At this point I wouldn't be surprised to find out there's a third Colorado River in some other state. It's quintessential America. Wouldn't want to call it the Texas River, would we?? There's another thing to confuse visitors to the Austin area: the lakes that are formed by several dams along the Colorado River. 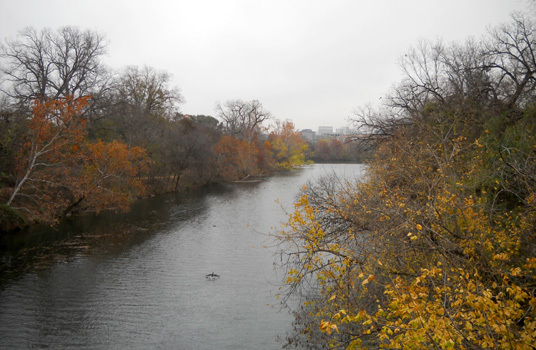 One of those dams near downtown forms Town Lake, which is called that on all our maps but named Lady Bird Lake (for Lady Bird Johnson) on the maps of the lake that are on the trail. Whatever it is called, most of the "lake" looks like a very wide river; it's one or two city blocks wide. 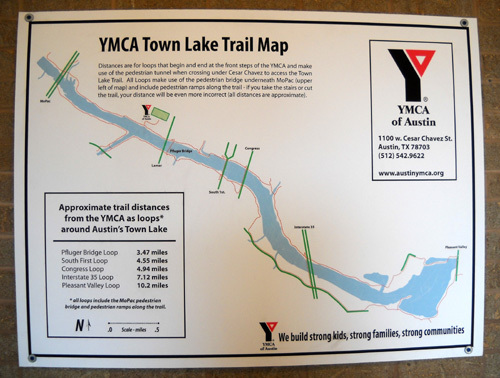 We found it very easy to access the Town Lake Trail when we worked out at this Y, which is located close to the Lamar Street bridges (one for vehicles, one for pedestrians). I've decided there must be as many runners and walkers per square mile in Austin, TX as there are in, say, California's Bay Area, which is a running mecca if I've ever seen one. It's 11 AM on a Monday in early December, not yet lunch time for the hoards of working folks in downtown Austin. 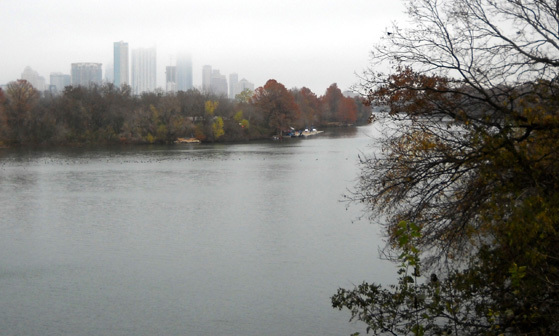 More specifically, it's a misty, 200% humidity, gray-sky Monday morning in the low 40s F., well below Austin's average of mid-60s for this time of the year. 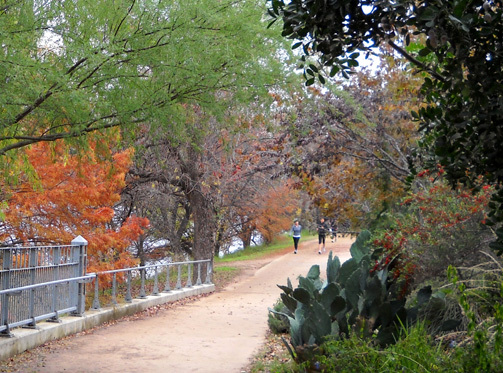 Jim and I have found our way to what must be Runner Central, the extremely popular Town Lake Trail. Only we had no idea it was this popular. We were surprised by how much company we had out there! They weren't just retired folks like us, either; there were people of all ages (except school age). As busy as the trail was that weekday morning with runners, walkers, and cyclists, I don't think I'd want to be there on a sunny weekend! In an old Runner's World "On the Road" article about Austin that I tore out and saved from long ago (June, 1996 -- I'm quite the pack rat, eh?) -- running store owner Paul Carrozza is quoted as saying, "On any given evening, say, 5:00 to 7:00, you'll see upwards of a thousand runners [on this trail]. On Saturday and Sunday mornings, even more." That was thirteen years ago. 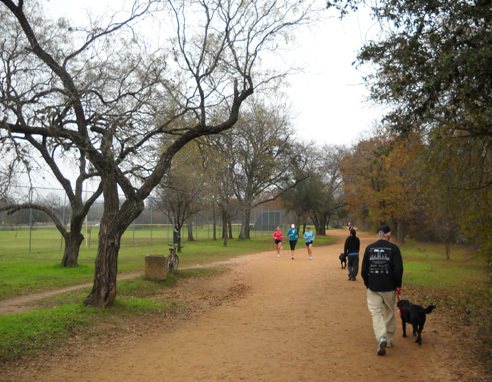 My guess is that there are even more runners and other trail users in Austin now. That may not be a huge problem, however. 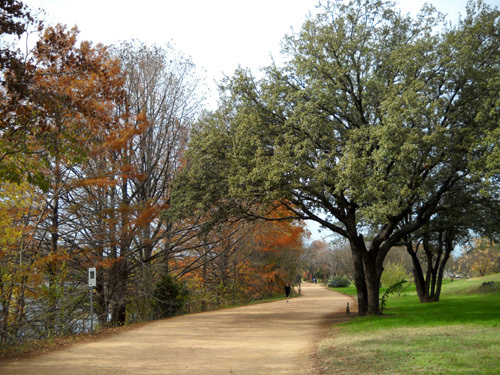 The Town Lake Trail is 10-12 feet wide in many places and can accommodate a lot of users if they behave responsibly. 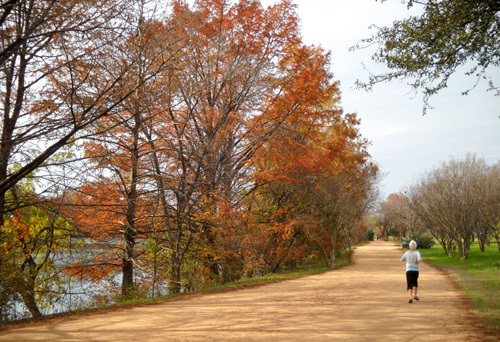 Unlike many of the folks who use the more narrow greenway in Roanoke, the folks I saw each time I used the Town Lake Trail seemed to be very considerate of other trail users. They stayed to their right. They kept their small children and dogs close to them. They didn't walk or run three abreast. If we'd been here longer, I would have had no qualms about riding Jim's trail bike on this part of the greenbelt. In Roanoke, too many clueless folks make cycling on the greenway more dangerous for everyone involved. My photos don't reflect the number of people on this trail the three days we ran and walked there. I'm not comfortable taking pictures of strangers approaching me on the trail unless it's in a race, where they expect that sort of thing. I tried to focus on the scenery in these photos instead of the people. If you saw this trail, you'd understand. I hope the photos in this essay adequately show what a great trail this is, even though it was overcast two of the three days we ran/walked there. 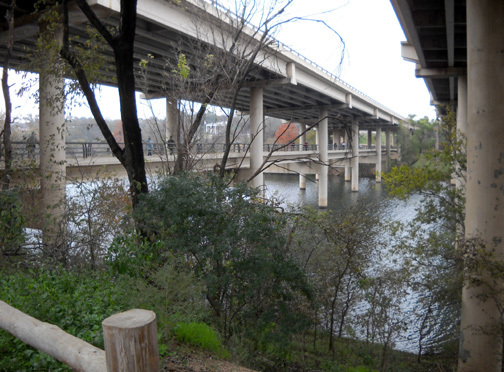 For one thing, most of the time the basic 10-mile loop is close to water -- either Town Lake/Colorado River or Barton Creek. 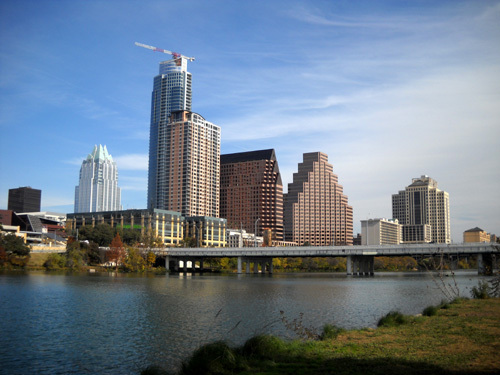 The water is soothing and the views across it are scenic, whether you're looking north toward Austin's skyline or south toward wooded areas. 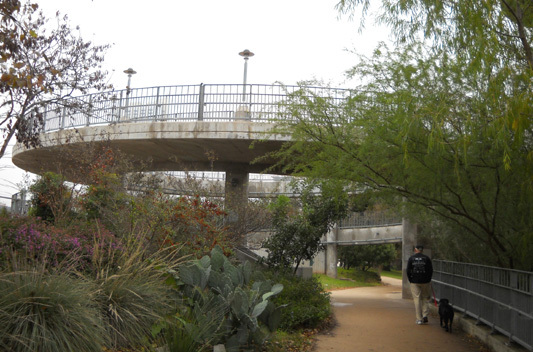 Lamar Street pedestrian bridge (above); a spiral walkway from Town Lake Trail to the pedestrian bridge (below) makes access easier for cyclists and for other folks who don't want to use the alternate stair steps. 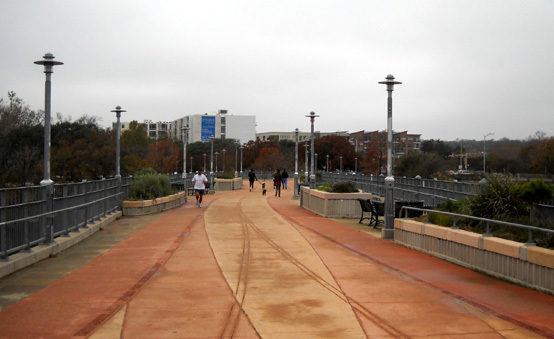 The bridges and some moderate slopes are the only places on the Town Lake Trail that are paved. That's another thing I love about this trail -- it is hard-packed crushed granite and/or limestone. 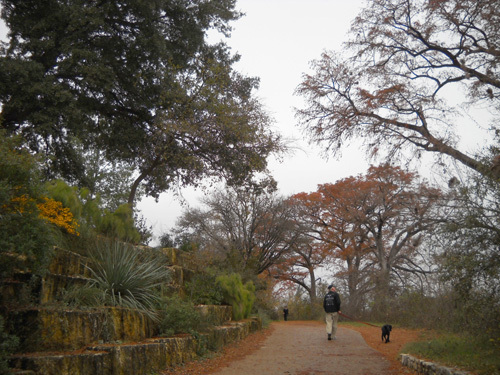 Despite all the rain Austin has had in December, the trail drains well and doesn't rut easily. Some of the other dirt trails in the greenbelt network are more narrow and a bit rougher, more like what we're used to running. Jim and Cody are dwarfed by the tall trees. Upper sign: Dogs can't flush -- scoop the poop! What a nice dog park! 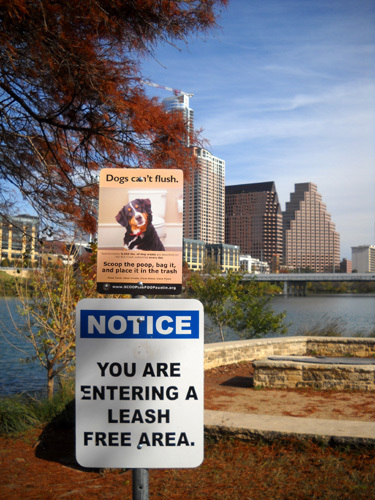 There's a large grassy area for them to run and play on the south side of Town Lake between the Lamar and 1st Street bridges. That was a sunny weekday morning, with even more folks (and dogs) out enjoying the trail. 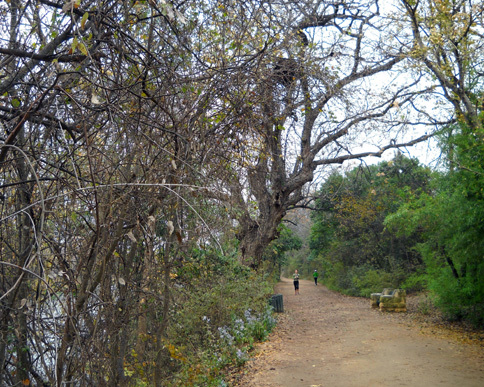 Despite the nearby traffic and skyscrapers, it's easy to forget you're in the middle of a city when you're on the Town Lake Trail. 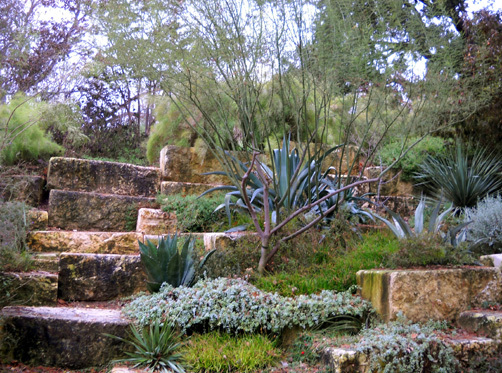 Thoughtful landscaping, complete with benches here and there, enhances the large trees and understory plants original to the lakeshore. 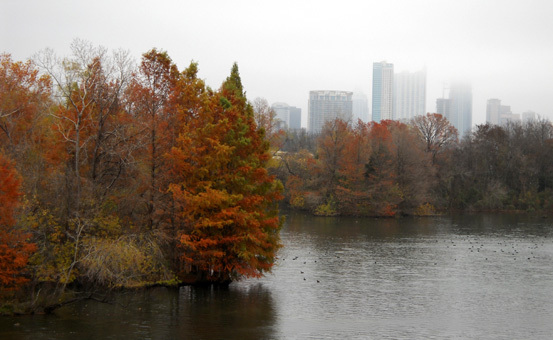 Common trees along the lakeshore are bald cypress, black willow, Texas pecan, American elm, eastern cottonwood, red mulberry, and box elder. 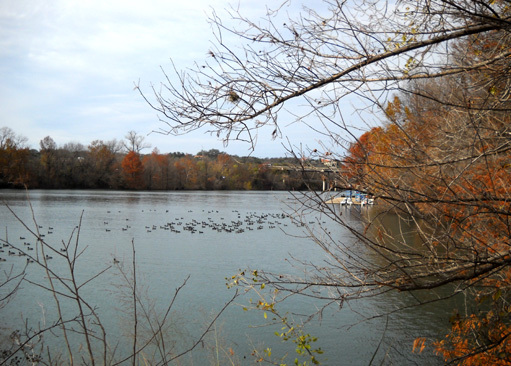 With all the water, flowers, shrubs, and trees along the Town Lake Trail, there are numerous birds and small mammals to watch and hear. 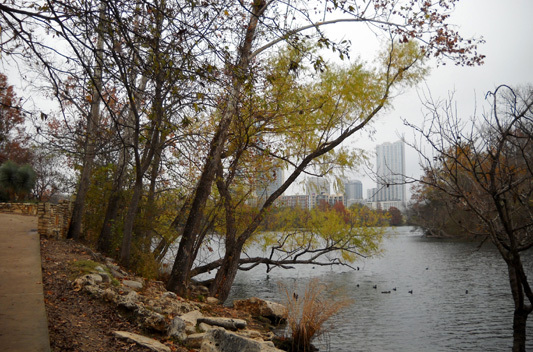 Herons, ducks, and other water-loving fowl hang out all year long in Austin's fairly mild climate. An information board along the trail lists over twenty species that frequent the area: great blue heron, yellow-crowned night heron, green-backed heron, double-crested cormorant, common nighthawk, red-bellied woodpecker, mourning dove, monk parakeet, cliff swallow, tufted titmouse, Carolina chickadee, Carolina wren, red-winged blackbird, ruby-crowned kinglet, belted kingfisher, American coot, lesser scaup, bufflehead, wood duck, pie-billed grebe, and the common mallard. The Parks and Recreation website has a link to a complete directory of all the trails throughout the city with site-specific .pdf maps for some of the more popular ones. Some of the trails are for both foot and bike traffic; some are only for pedestrians. 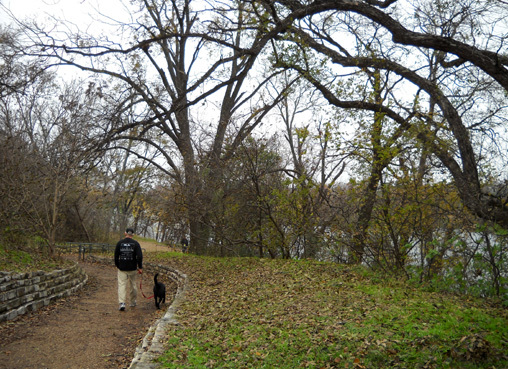 Jim and Cody head for Town Lake Trail from one of several parking areas along the loop. 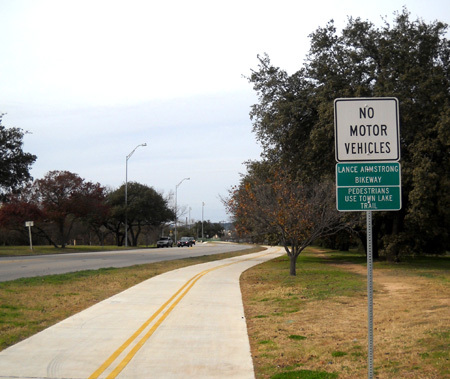 There is also a wide, paved, 3+ mile veloway for only cyclists and rollerbladers. Most of it winds through scenic Slaughter Creek Metro Park. 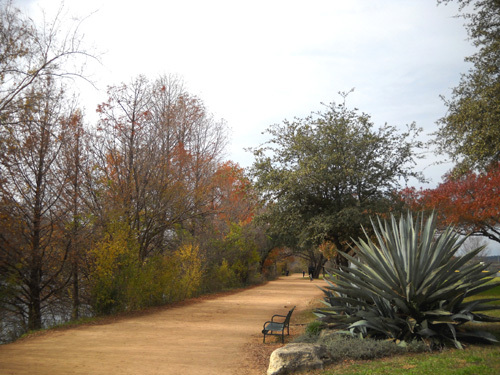 We crossed it one day when we ran from the Town Lake YMCA over busy Cesar Chavez St. to the Town Lake Trail. 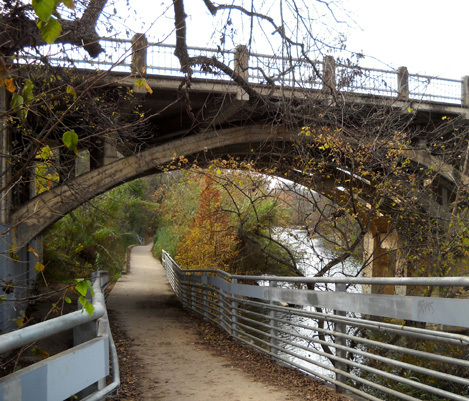 Neither of us has ridden our bikes on the veloway (below) or Town Lake Trail yet. We like Austin and will be back. There are a lot more things we want to see and do here, including exploring more trails in the greenbelt system and other parts of the city. Next entry: so what else did we do in Austin? ?